Heres mine as of 12:07pm MST. Gamefuel and DNS relay enabled. Did a ping test at Pingtest.net I would like for you guys to also post what you guys got. Still haven't began working on it, I believe I got that score because theres a lot of people probably connecting at this time. 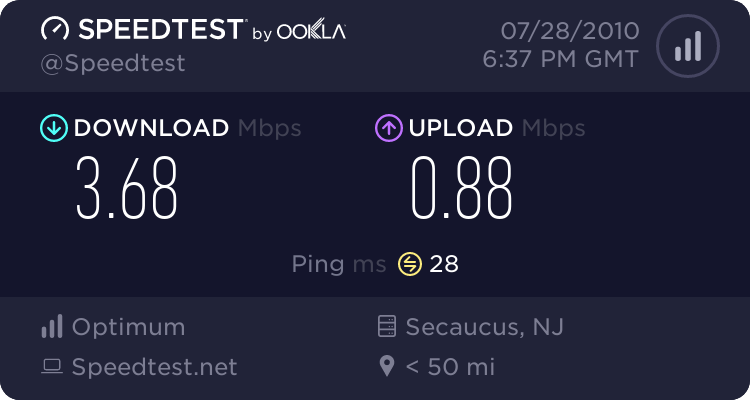 Also the 20 down speed is not recently that was from 7/3/10. 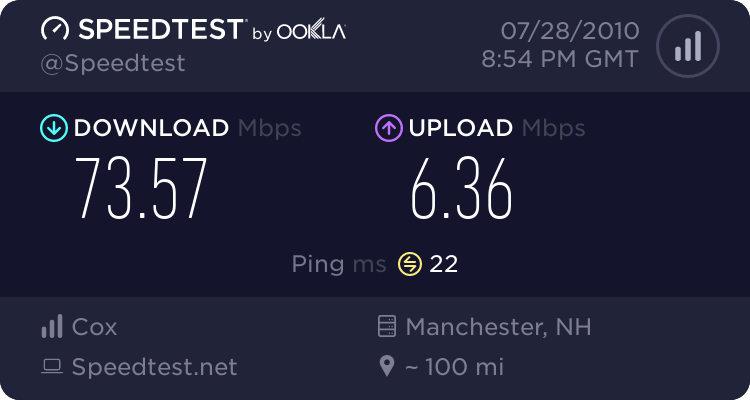 But usually I get very good speeds weird I got that low xD. I will begin working on it later if I see any further issues. This is during peak times. Sometimes spikes up to 100Mbps. Its not a accurate test though. Realistically I see about 50-55Mbps, which is still pretty good. Lookinto...man, we need nicknames here BAAAAD. LOL. BTW, just call me Tricky. Anyway, it looks like your latency went from 28 to 19, so it very well may have been the server, or the pathway to the server. Have you tried the ping test? Maybe a traceRT to see where the latency is? Also, Visualware Speedtest is awsome. Gives you soooo much more data on your connection. Tricky got some serious speeds. You wouldn't mind me moving into your house? But for real are you in a university? Or something like that? Or near your cable provider? Nah you glitch that? Nah for real? Nah what? That is some crazy speed Life will never be the same from this day on. Anyways you can call me Chris I just seem to like the name lookintomyeyees seems catchy. But wow!!! I won't sleep tonight, 73Mb! its taunting me. I think Trikein Tricky is just bragging. People call me Furry. How about you, Ol One Eye? I would have to agree with (wait is it furrynutz?, furry?, nutz?, Come on give us a nickname). Ok..maybe bragging a little bit. But no, no real trick. I do live on the street that the backbone for URI goes on, so its probably a bit more robust then most. Other then that; DOCSIS 3.0 with Ultimate, a seperate dedicated IP for my PC, and perfec signal levels. Plus I tweaked my registry and TCP. 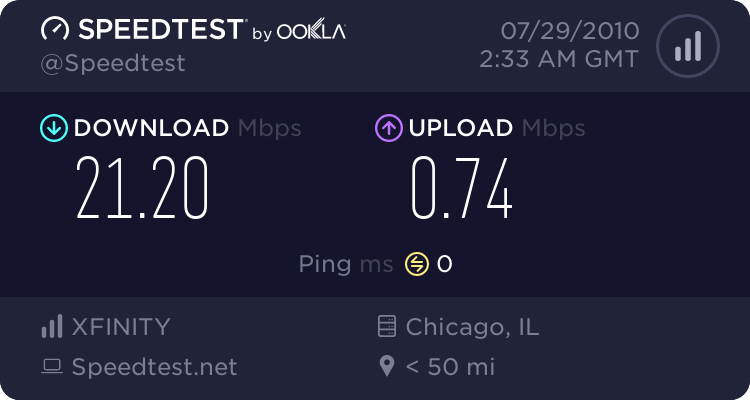 My record is 101Mb down and 9.5 Mbps up, but I can't access it since I have that new IP. 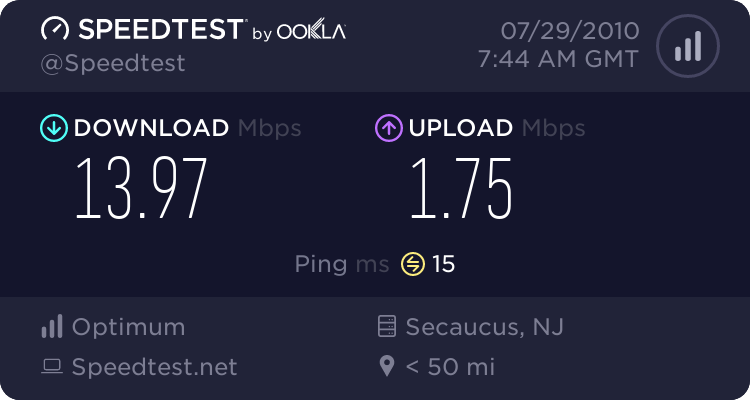 If it makes you feel better I am moving into a place where my rent is double, so I have to downgrade my services to 15Mbs down. ::frown:: Im going to miss it. 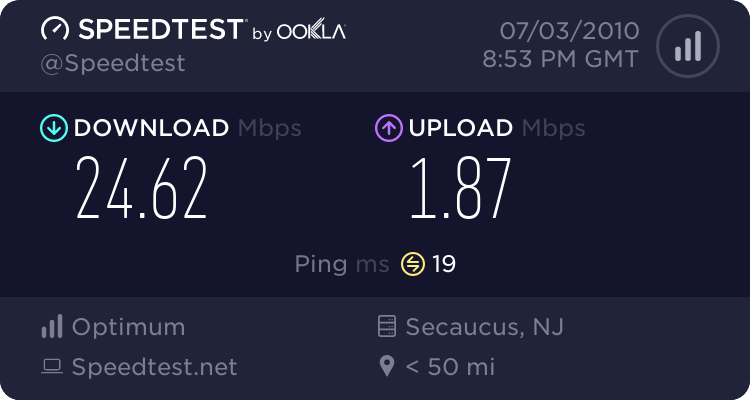 I have comcast 12/2 w/ SB6120 (DOSCIS 3.0 its great I'm tellin you!) 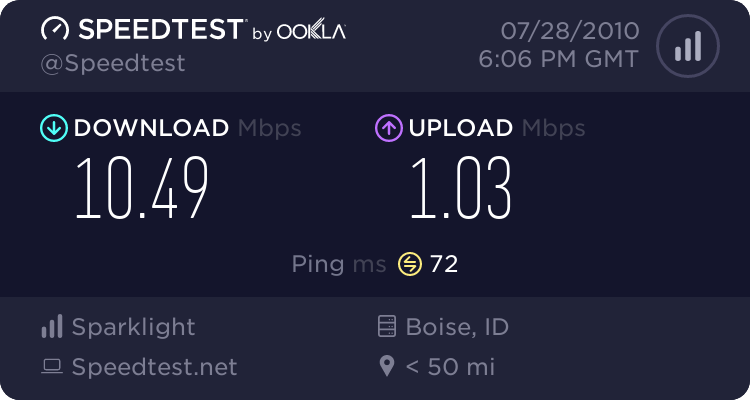 and I always seem to get 20mbps down, but sometime the up isn't up to par. Never seems to be a drag on things like gaming though. With a ping of 0 you should not worry if you are going to lag or have issues in game, pretty neat. Btw anyone here uses lockerz? or have heard of it? Its pretty cool.